Courtesy Photo L-r: Clayton Fisher and Lindsey Gilmore with chapter advisor Neil Swonger holding the awards for the Gold Medal Chapter at the Ohio STate FFA convention. 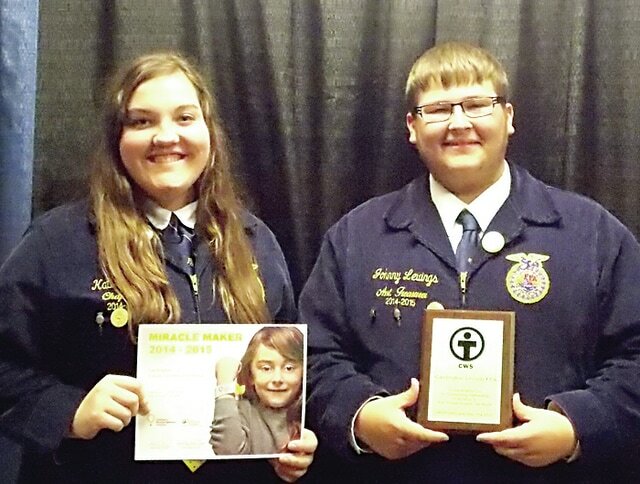 Courtesy Photo Katie Haught and Johnny Levings, with Cardington FFA accept awards for their donations to Children’s Hospital and CROP Foundation at the Ohio STate FFA convention. During the trip to the Ohio State FFA convention on April 30-May 1 some of the Cardington FFA students became familiar with the stage, receiving awards and recognition for their hard work and good hearts. Starting the convention, Katie Haught walked across the stage to receive the Children’s Hospital Award. In order to receive this award a donation of at least $1,000 has to be donated. The Cardington FFA donated $1,200 which was raised during FFA week, February 21-28. Next, Johnny Levings walked across the stage for the CROP award which helps feed kids across the country. The Cardington FFA donated $200 to the CROP foundation. Clayton Fisher and Lindsey Gilmore crossed the stage next to receive the Gold Medal Rating Chapter Award. The Cardington FFA Chapter was ranked 15th out of 375 chapters. This award is based on student, chapter and community development. It could be said the Cardington Chapter made a clean sweep at this year’s Ohio FFA State convention.